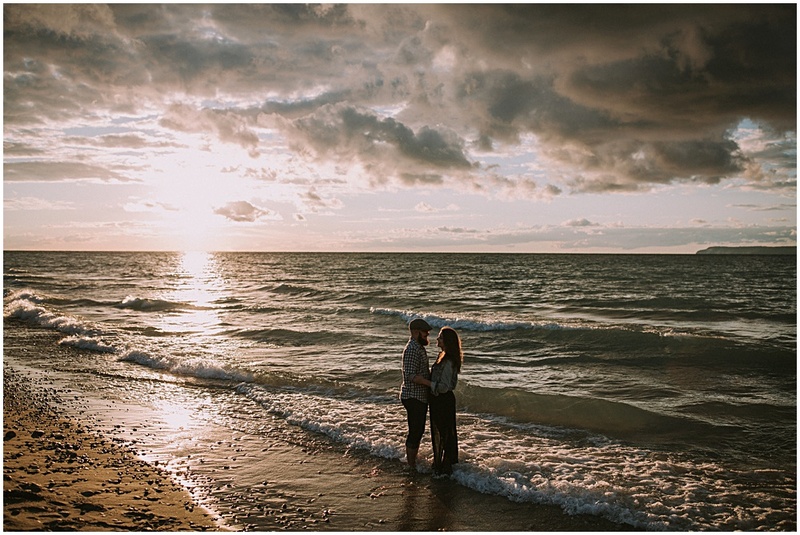 Torey and Stephen live in Grand Rapids, Michigan and the two have been making weekend trips to Traverse City for a long time. 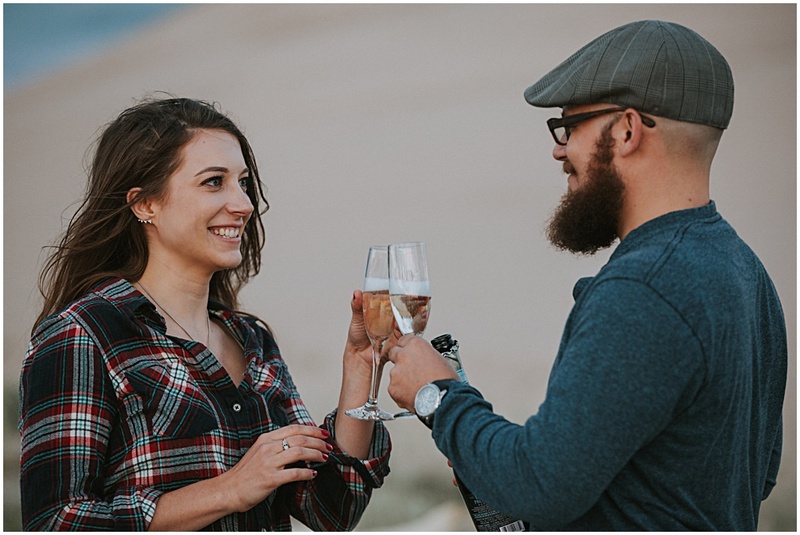 Actually, Stephen recently proposed to Torey under a full moon at Sleeping Bear Dunes National Lakeshore. 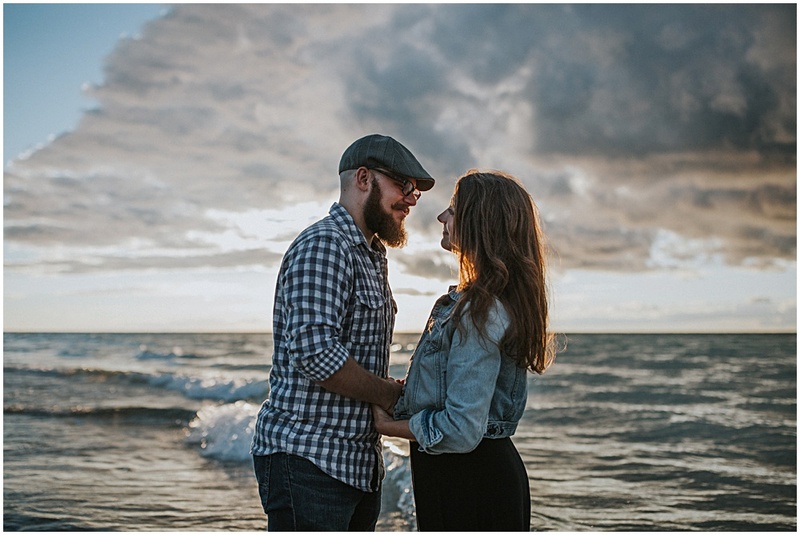 Recently, Torey and Stephen contacted me about photographing their Northern Michigan engagement session. 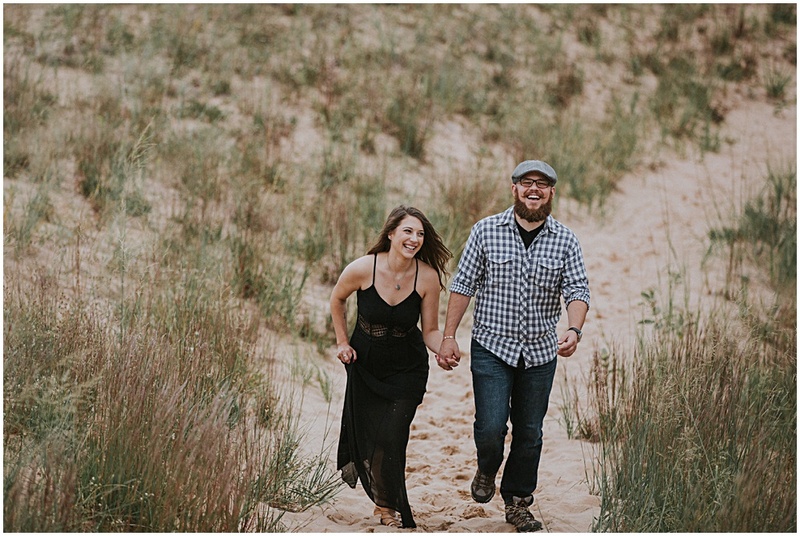 So I suggested we go to the Sleeping Bear Dunes for their engagement photos. The two were on board 100 percent. 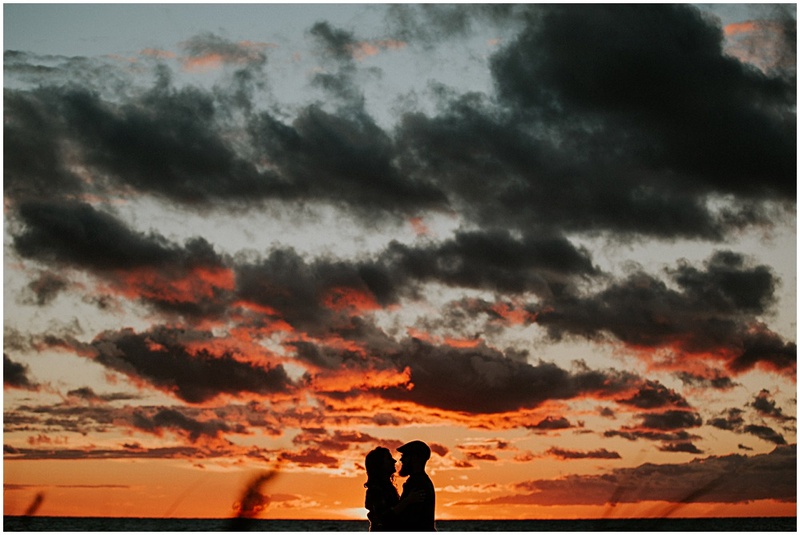 Torey and Stephen packed their dogs in the car and met me at the Sleeping Bear Dunes for the most amazing sunset. 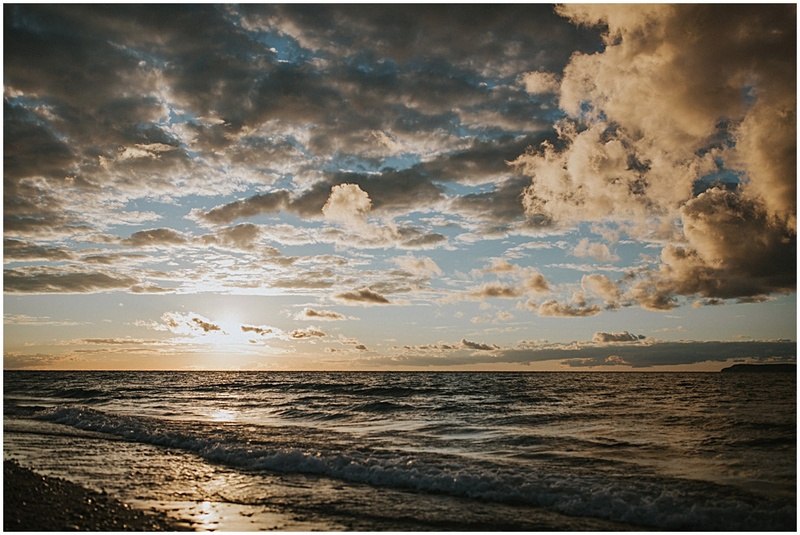 Sleeping Bear Dunes National Lakeshore was named the most beautiful place in America. The park is not far from Traverse City. 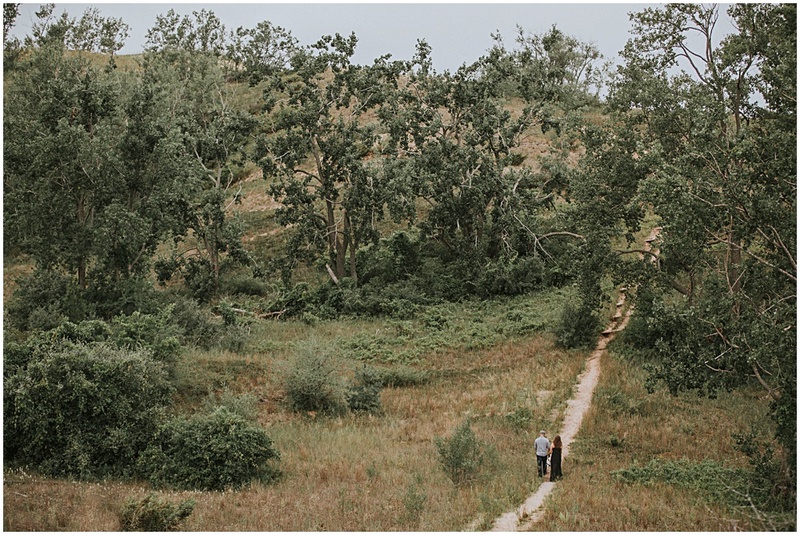 With miles of sand beach and bluffs that tower over 400 feet above Lake Michigan, this place is a really fun place to hike in the summer. Actually, it’s great in all seasons. 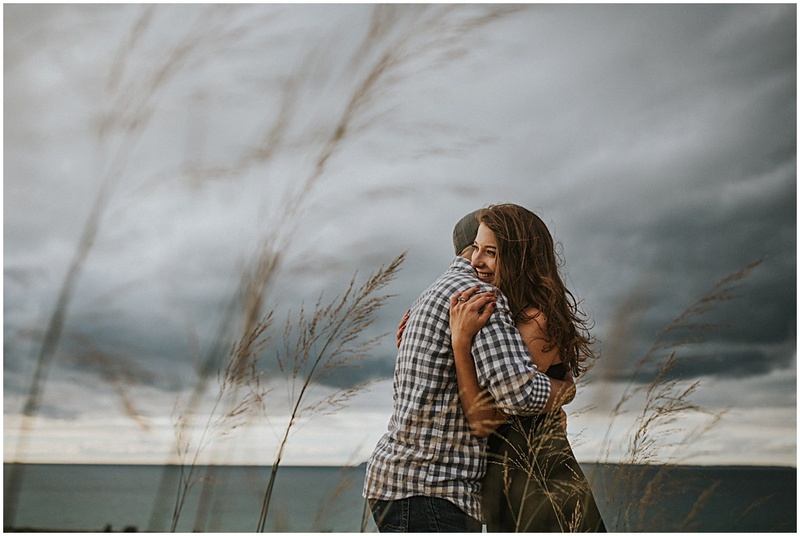 And it’s one of the most popular destinations for Traverse City engagement sessions. 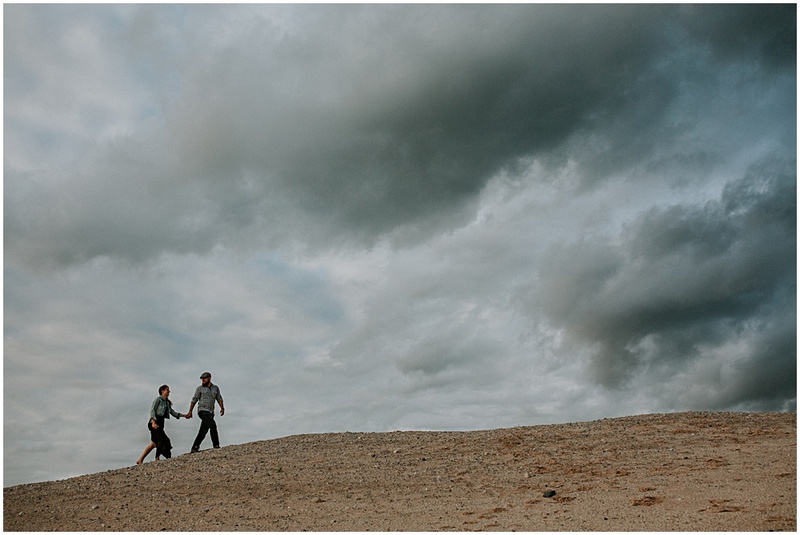 For Torey and Stephen’s hike at Sleeping Bear, we ditched the sandals and enjoyed the most leisurely walk to Lake Michigan. I love being able to run around the beach taking photos with no shoes. 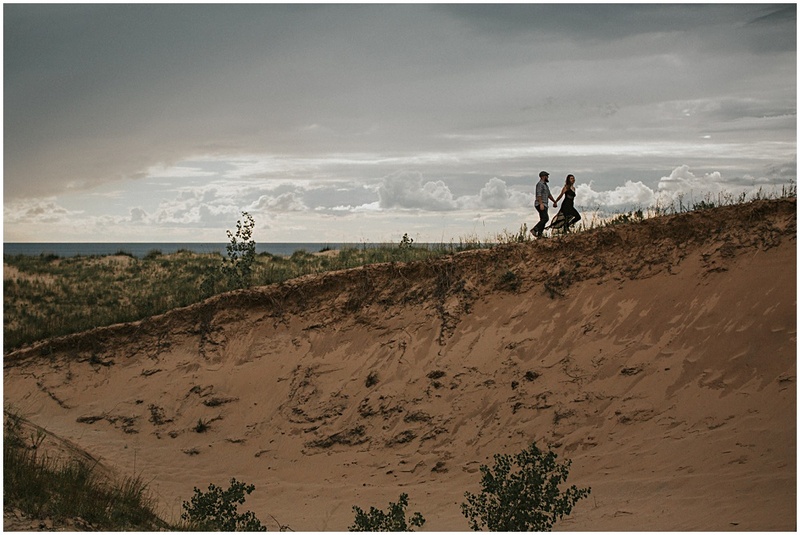 Recently, I photographed an elopement at the Sleeping Bear Dunes and one of my favorite parts was ditching the shoes. 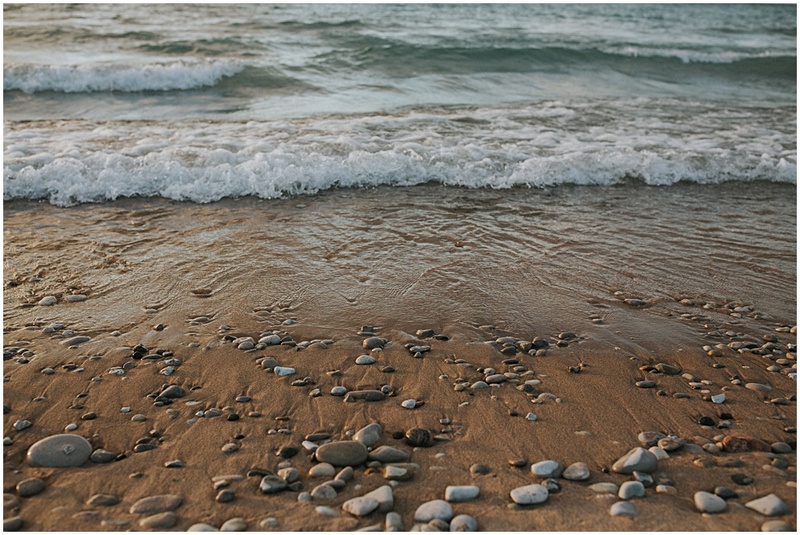 The beaches around Lake Michigan have the softest sand. I’m telling you this place is like no other on earth. I first heard about the Sleeping Bear Dunes when I was just a kid. My aunt lived in Traverse City and I visited from Chicago. I vividly remember family hikes at Sleeping Bear Dunes. It was incredible to think that this amazing place was right here in the midwest. 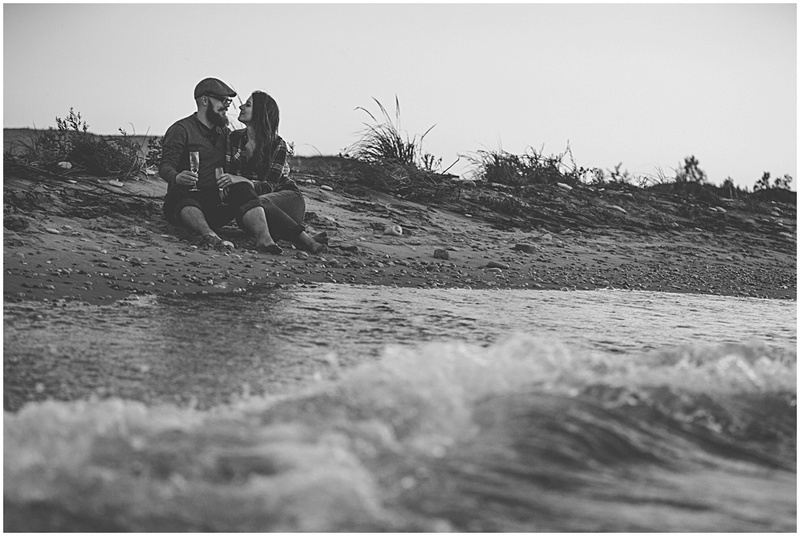 Then I moved to Traverse City and started photographing engagement sessions. And I fell in love with Sleeping Bear all over again. I’ve since discovered many amazing hikes at Sleeping Bear. By the way, I love taking families to the Sleeping Bear Dunes. To get an idea of how truly magnificent Sleeping Bear is, you really need to appreciate it in all seasons. The changing seasons is what makes Northern Michigan great. To see what I mean, check out my springtime engagement session at the Sleeping Bear Dunes. 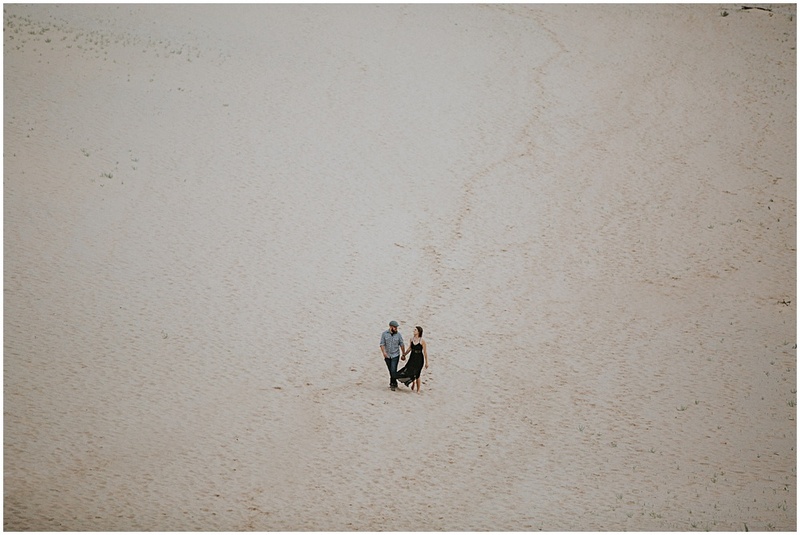 And then take a look at my winter engagement session at the Sleeping Bear Dunes. 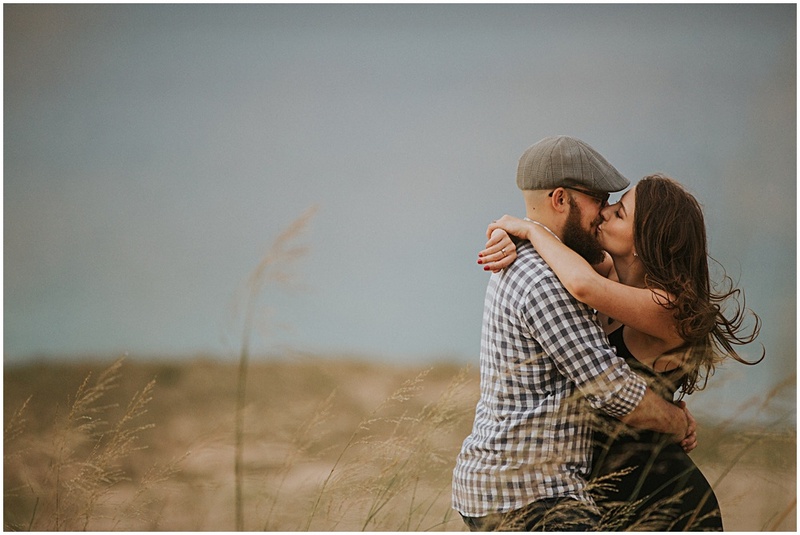 Before Torey and Stephen’s engagement session, I decided to camp along the lake for the week and do some exploring around the dunes. Michigan summers are unbeatable. So I was enjoying the cool air and beautiful Lake Michigan scenery. Also, I scouted out some of the lesser known trails at Sleeping Bear Dunes. 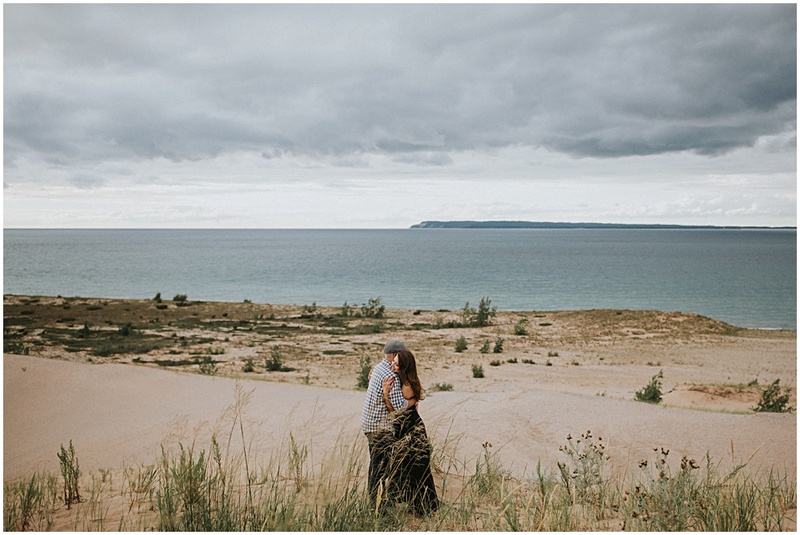 One of my favorites is the more private areas near Glen Arbor, Michigan. 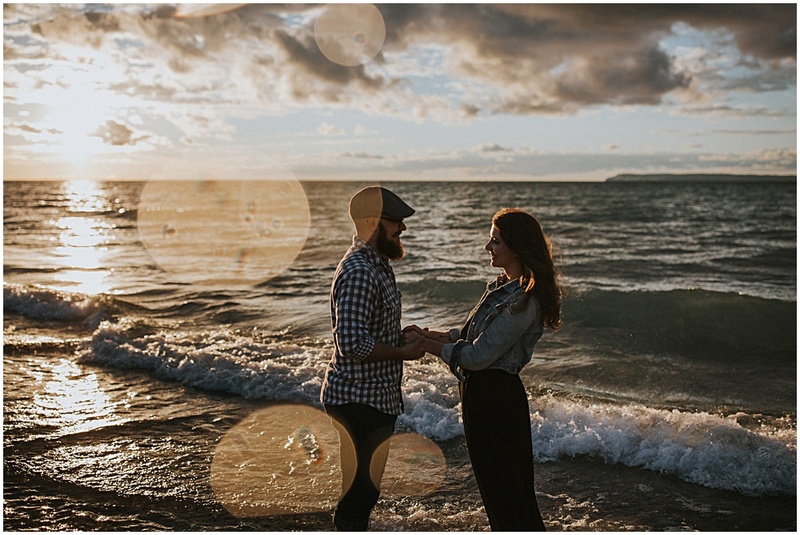 I happen to love the town of Glen Arbor and would love to do a sunrise engagement shoot there one day. Just putting that out there. 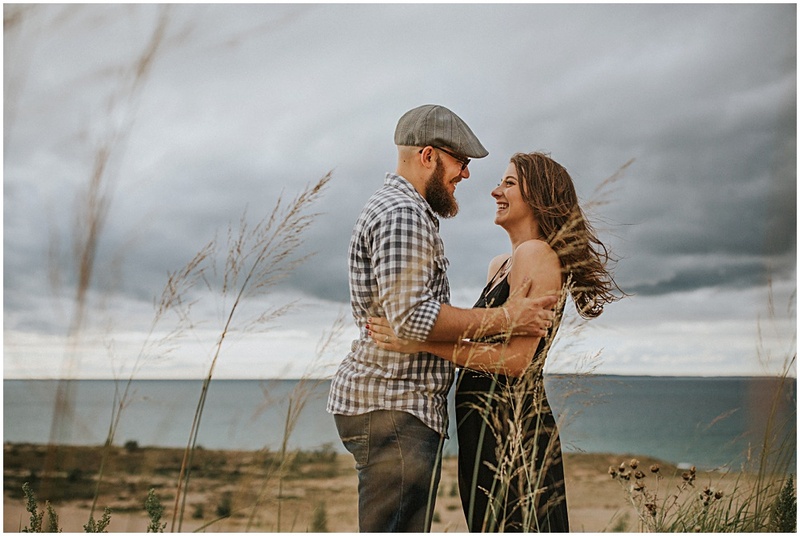 And I offer free scouting assistance for all my Northern Michigan engagement sessions. I’ve found lots of hidden gems through my scouting expeditions. 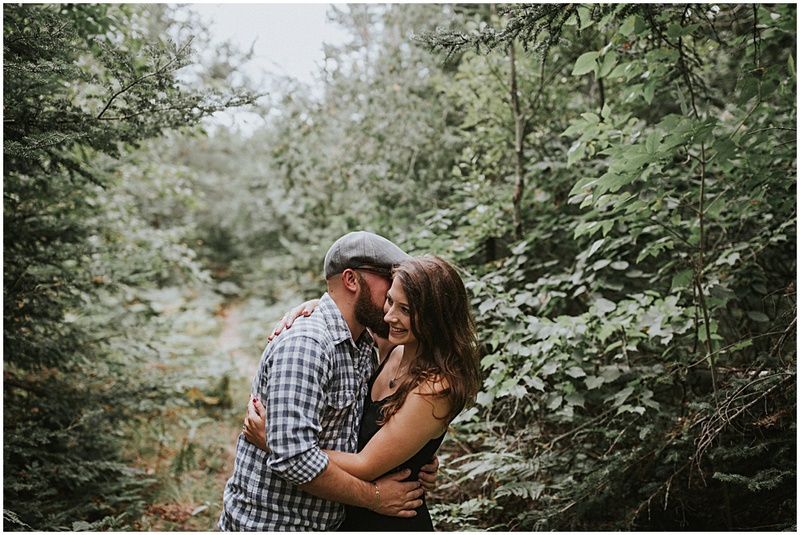 The hike I chose for Torey and Stephen’s Traverse City engagement session starts out in the forest and then climbs over some dramatic dunes. Torey and Stephen brought their two dogs along for the hike and we wandered around the dunes. 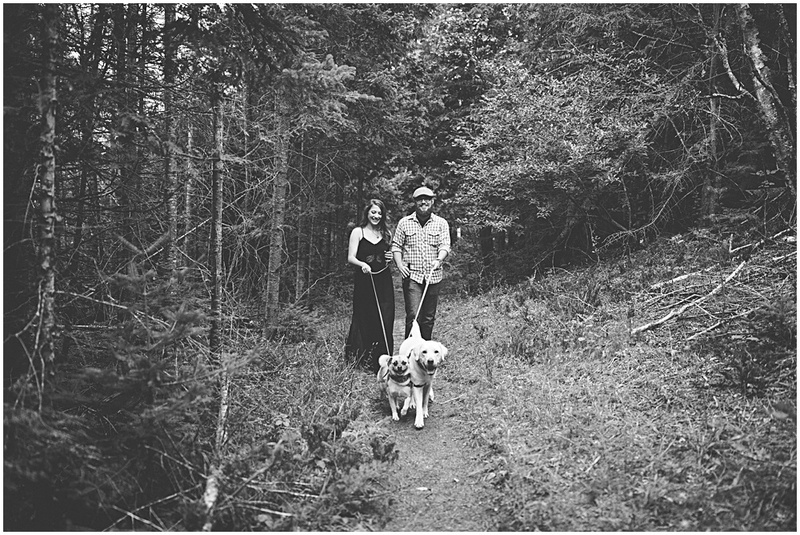 Just a note, Sleeping Bear Dunes has some dog friendly trails, but just check beforehand. 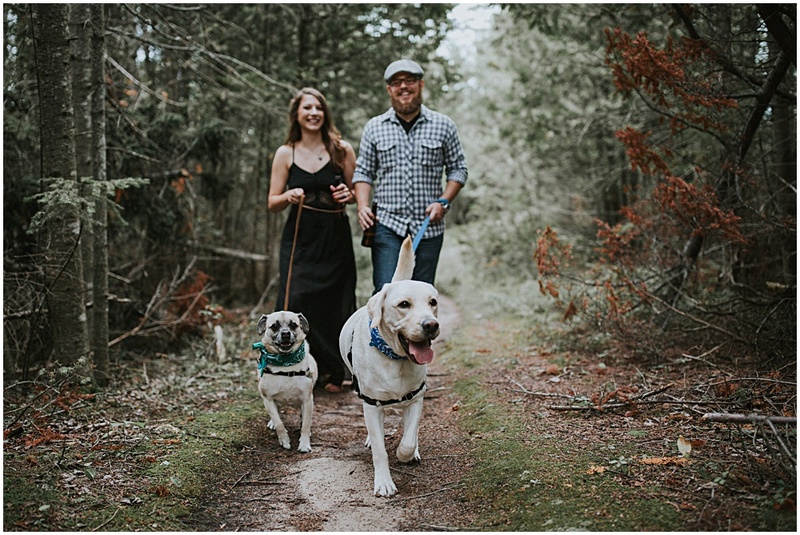 I love including furry friends and I know plenty of dog-friendly and beautiful trails and beaches at Sleeping Bear. 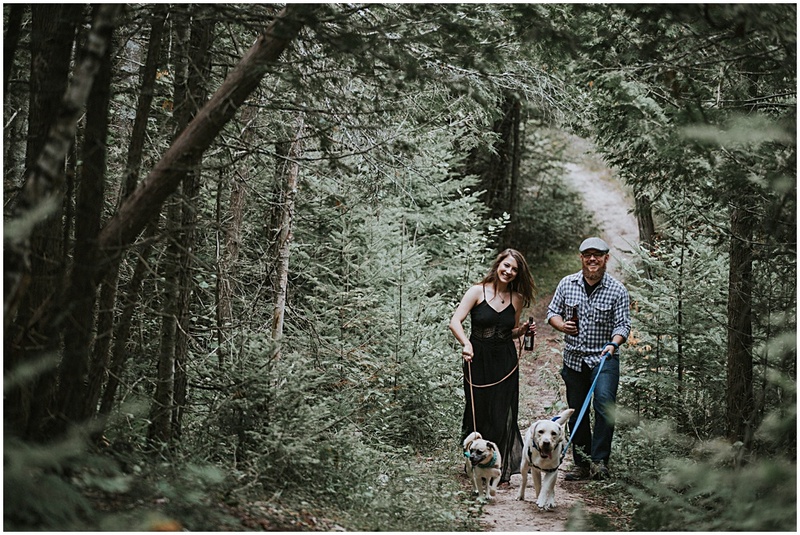 If you plan to bring your dog to your Traverse City engagement session, I suggest planning a second shooting day devoted just to your furry friends or bring a friend along. 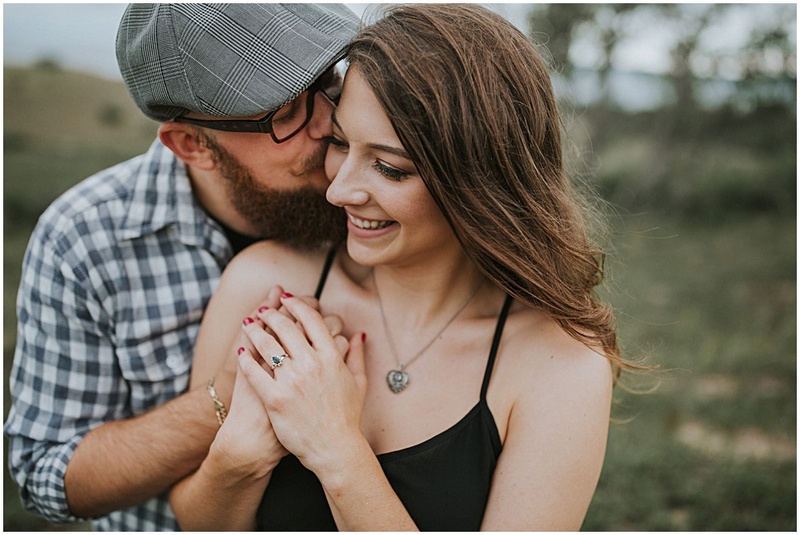 For Torey and Stephen’s engagement, I luckily had a second photographer available to help with the dogs. 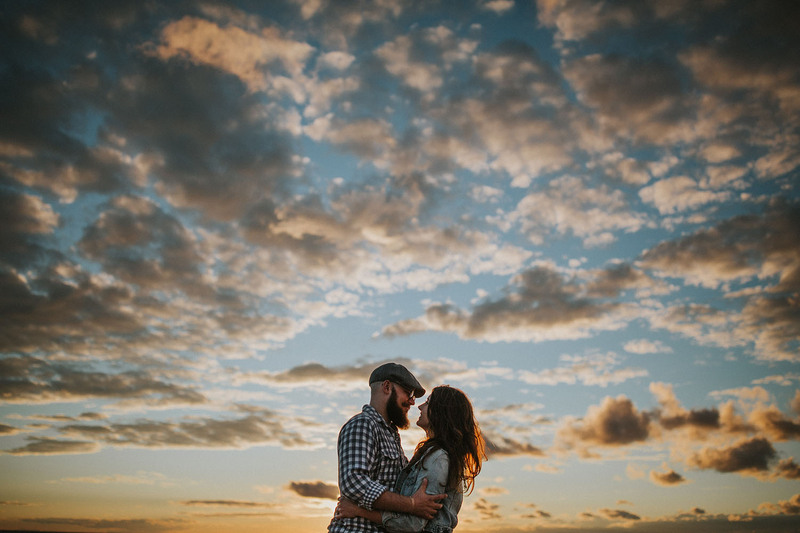 This is the reason why people choose a Northern Michigan engagement session. 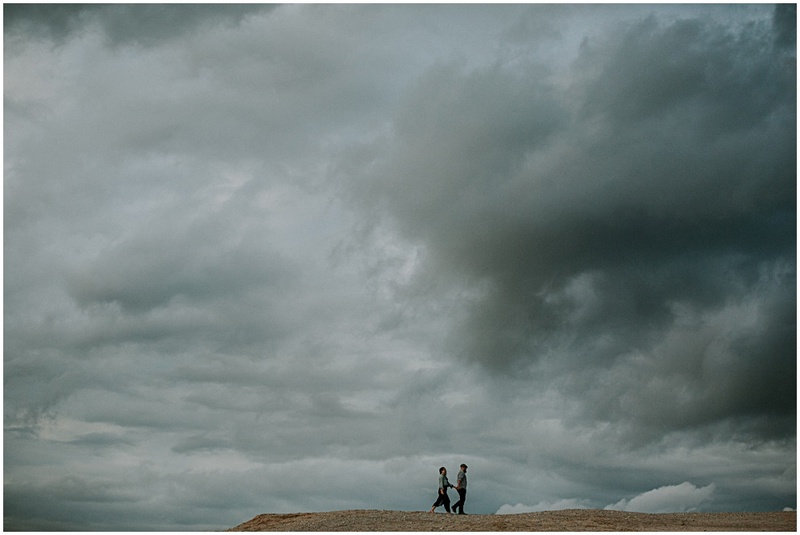 When we got to the Sleeping Bear Dunes, the clouds were vibrant and constantly changing, making for some incredible photos. 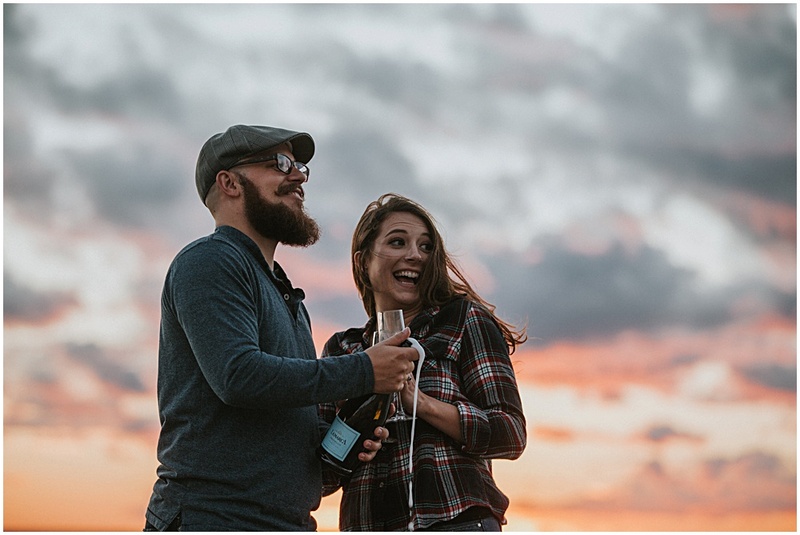 We popped open a bottle of champagne and relaxed by the lakeshore. It’s a good thing we packed the headlamps because it was getting dark. Also, it’s a really good idea to pack some extra layers. Even though it’s the summer, things can get a bit chilly in Northern Michigan. 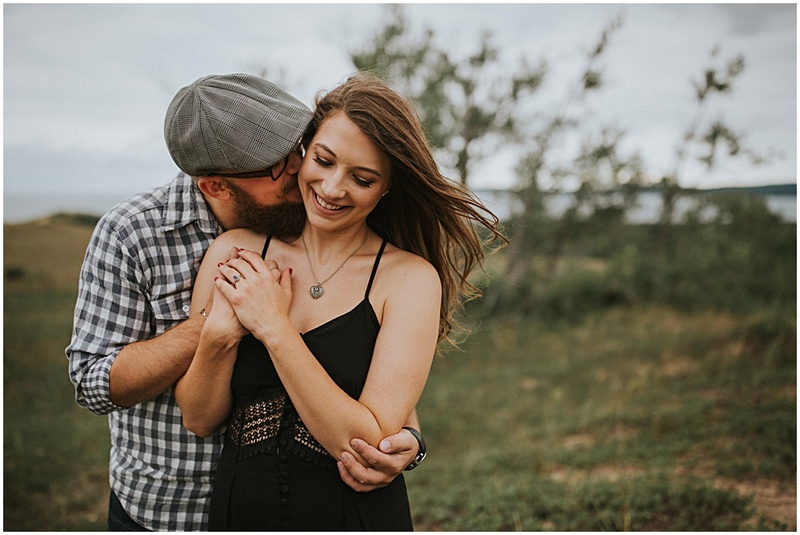 We all hiked back to our cars and then drove to the nearest town to find the last open restaurant on a Sunday, stuffing our faces on some well deserved tater tots. Yum! 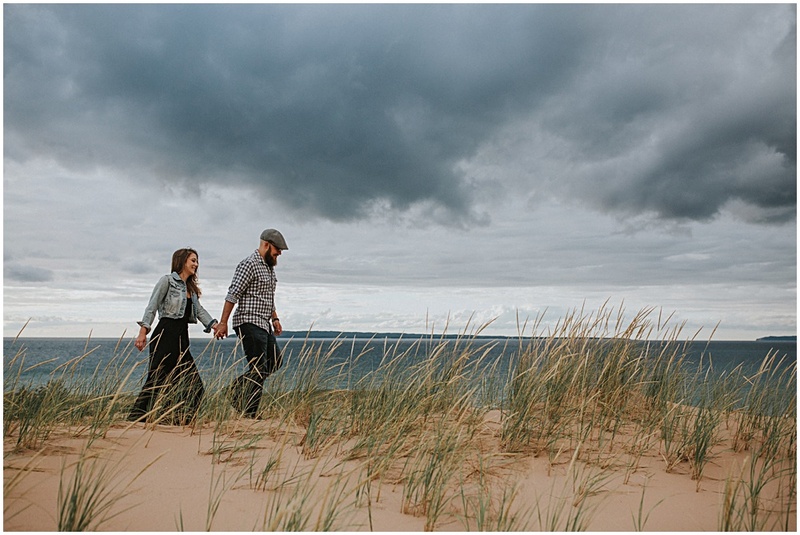 Thank you Torey and Stephen for including me on your Sleeping Bear Dunes adventure.